Jerome Bernard Orbach (October 20, 1935 – December 28, 2004) was an American actor and singer, described at the time of his death as "one of the last real leading men of the Broadway musical and global celebrity on television" and a "versatile stage and film actor". Orbach's professional career began on the New York stage, both on and off-Broadway. Nominated for multiple Tony Awards, Orbach won for his performance as Chuck Baxter in Promises, Promises (1968–1972). Later in his career, Orbach played supporting roles in films such as Prince of the City (1981), Dirty Dancing (1987), Crimes and Misdemeanors (1989) and Disney's Beauty and the Beast (1991). He also made frequent guest appearances on television; including a recurring role on Murder, She Wrote (1985–1991) as private detective Harry McGraw. 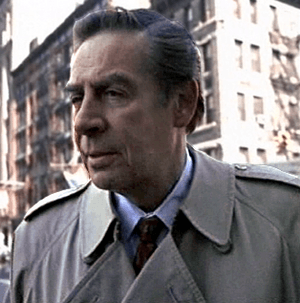 However, he gained worldwide fame for his starring role as NYPD Detective Lennie Briscoe on the long-running NBC crime drama Law & Order (1992–2004). 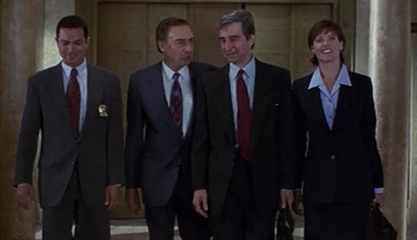 Prior to his death, Orbach was signed to continue in the role of Lennie Briscoe on the new spin-off Law & Order: Trial by Jury, which was to accommodate his illness by giving him a lighter schedule than he had had on the original series, but he was only featured in the first two episodes, both of which aired following his death. Orbach was married in 1958 to Marta Curro, with whom he had two sons, Anthony Nicholas and Christopher Benjamin; they divorced in 1975. Elder son Tony is a crossword puzzle constructor for The New York Times and also guest starred on the Law & Order episode "Doubles" as a reporter. Younger son Chris Orbach, who is also an actor and singer. In 1979, Jerry Orbach married Broadway dancer Elaine Cancilla, whom he met while starring in Chicago. Orbach lived in a high-rise on 53rd Street off Eighth Avenue in Hell's Kitchen and was a fixture in that neighborhood's restaurants and shops. His glossy publicity photo hangs in Ms. Buffy's French Cleaners, and he was a regular at some of the Italian restaurants nearby. As of 2007, the intersection of 8th Avenue and 53rd Street was renamed in honor of Orbach. In January 1994, less than two years into his stint on Law & Order, Orbach was diagnosed with prostate cancer. He succumbed to his cancer on December 28, 2004, at the Memorial Sloan-Kettering Cancer Center in New York at age 69. Despite being diagnosed with the cancer more than a decade before his death, Orbach's illness was not revealed to the general public until just weeks before he died. 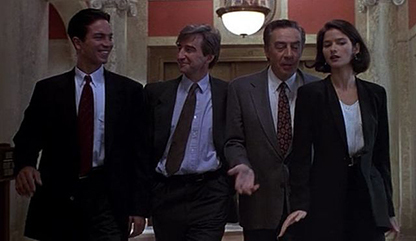 The day after Orbach's death, the marquees on Broadway were dimmed in mourning, one of the highest honors of the American theatre world, while NBC re-aired the Law & Order episode "C.O.D." (the last episode of the original series to feature Orbach) in honor of him. Jerry Orbach Facts for Kids. Kiddle Encyclopedia.